Smash Repairs Sydney has fully quallified mechanics who can organise for the mechanical repair of your vehicle. Often in an accident the engine, gearbox, steering system or suspension system can be damaged. Our experience at mechanical repair can ensure the total repair of your car both for looks and in the safeness and road worthyness of your vehicle. We test drive all our " car repairs" to ensure satifactory and safe performance. Our workshop can if nessesary repair your cars components using genuine parts or on your agreement replace damaged components with after market components from resellers of engines, gearboxes, struts or steering systems. Depending on your vehicles age and its usage you may instruct us to do what is in your best interests. We can guide you to the best decision for all mechanical repair and car repair situations. Trucks and vans are our speciality so give Smash Repairs Sydney a call and we'll get your car repaired and roadworthy again. Correct alignment is important after a front end collision. 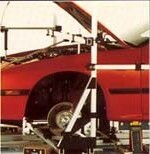 We have the Autorobot Measuring System for the car repair.